Perhaps more significant, he's signed up one of Illinois' top GOP fundraisers, Lori Montana, which at least in theory gives him the ability to pull serious coin here. 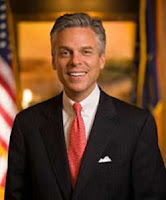 Mr. Huntsman, 51, has a reputation for being a relative moderate, though like other GOP contenders he's recently moved to the political right, for instance backing off his support for a cap-and-trade pollution control system. But as governor, he was known for slashing taxes and attracting jobs, while simultaneously backing gay civil unions and making it easier to get a drink in the heavily Mormon state. And he actually said some nice things about Barack Obama when the president named him ambassador — not a big plus with many Republicans, but potentially a bipartisan lure for independents. Anyhow, Mr. Huntsman's name recognition has to be in the low single digits. But he's starting to attract some media attention, and it's shaping up to be a strange GOP race. Well it's still early yet. No one has become the candidate to watch so far. Maybe we'll know by the time of the Iowa caucuses and the New Hampshire primaries.